During my last GP visit where I had 2 (yes TWO) steroid shots in my gluteus maximus :-) I got to talking about how I make a living from building websites and turns out my GPs wife runs a small local business in Skegness (where I live), a couple of holiday apartment rentals in Skegness : walk by one of the holiday apartments all the time, two minutes walk from Skegness beach where my wife and I walk most days. They are looking to upgrade their business website (they are looking to pay for web design help) and to be brutally honest I can understand why: out of date design, not mobile responsive, poor SEO etc… since I no longer take on paying SEO client I offered to take a look and give some free advice. Makes for a great excuse for a case study on why small businesses shouldn’t use website builders like DreamWeaver or FrontPage (FrontPage was discontinued in 2006, replaced by Microsoft Expression Web) and should use WordPress as a Content Management System (CMS) : or at least a CMS even if it’s not WordPress. For Google search engine visitors who find their way to this page via Skegness relevant searches you are probably looking for Skegness Apartments or Skegness Attractions, two of the Skegness relevant websites discussed below. Even though I’m not targeting this article at Skegness Google Search Engine Results Pages (SERPs) I’m pretty much guaranteed traffic because I’ve used relevant phrases below. As I write this I know no more about the holiday apartment website, business etc… as you do, my ‘inside info’ (from my GP) is the Skegness Apartments site exists and the business owner is looking for a web design update, so anyone could do this exact analysis on their business website or a competing business site. 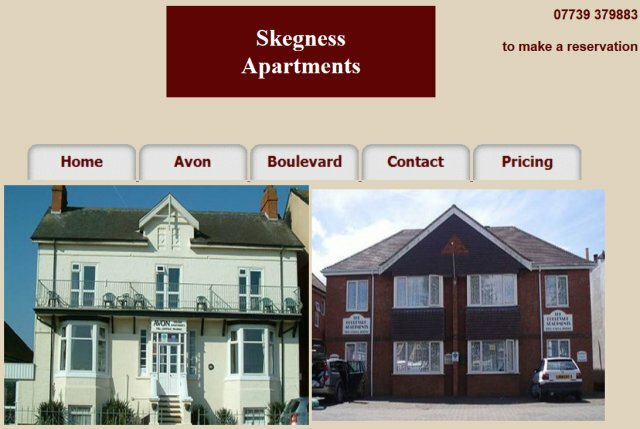 Skegness Apartments is your typical small business website that’s either been built by a small local website design company (there’s quite a few in the Skegness, Boston and Lincolnshire area) or someone within the business with basic HTML/design skills (what my first websites looked like) : as an SEO consultant I worked with a lot of small businesses in this sort of situation and see the usual mistakes. I was a little surprised to find it’s a relatively new site (the website design is how sites looked 5+ years ago), first registered early 2012, (search Google for “Whois” and pop a site URL into one of the free Whois checking sites to see some domain data) so only a couple of years old: I was expecting a minimum 5+ years old. After looking through the WayBack Machine results http://archive.org/web/ was even more surprised to find the design is new (added sometime in the past 6 months). As you can see from the screenshot above it’s a very old, out of date website design that won’t be doing them any favors with potential holiday makers looking to rent a holiday flat in Skegness. I always jump straight into the code and in FireFox – “Right Click” on a page and “View Page Source” I find the footer code is completely missing (truncated HTML code: FireFox View Page Source shows possible errors in red). One of the risks of using a WYSIWYG editor, looks OK in a browser window, but behind the scenes the code can be a mess. Looking through the code looks like it was built with the What You See Is What You Get (WYSIWYG) type HTML editor Microsoft FrontPage (not a very good website design building tool to say the least, not easy to use). I’ve not had to look at a site created in FrontPage for years, I wonder if it’s built with Microsoft Expression Web and MS has used the same names for things? Looks like the footer template file has been deleted by mistake: easy to make this mistake with WYSIWYG website builder software. As I delved deeper into the site found pages with a Back button where the hoverover code works. It’s been around 8 years since I built a website in DreamWeaver (another WYSIWYG type editor), but from memory I do recall it was a pain to build new web pages: build your header, footer templates etc… and build individual template files for each main content source! I remember dropping the templates into a text editor to fix broken code! Not easy for your average non tech savvy small business owner, maybe that’s why some local website design companies use tools like DreamWeaver? Build a site the business customer can’t easily edit, they have to pay the design company money for every tiny little content edit that the business could easily do themselves in a CMS like WordPress: you could train a monkey to use WordPress, it’s that easy. I’m impressed by any small business owner who had to learn web design from scratch that’s even manged to get a site online using tools like FrontPage! Having easier access to content to edit is more than enough reason to use a CMS like WordPress over HTML editors like FrontPage. Not even looked at the SEO yet, (unusual for me, normally the first port of call :-)) a few pages in I’m seeing big SEO issues. A site:domain.tld search in Google, use your domain name minus the http://www. part into a Google search and Google will list every page it has indexed from that domain. Lists 33 pages indexed, so no issues with spidering/indexing (it’s a small site). 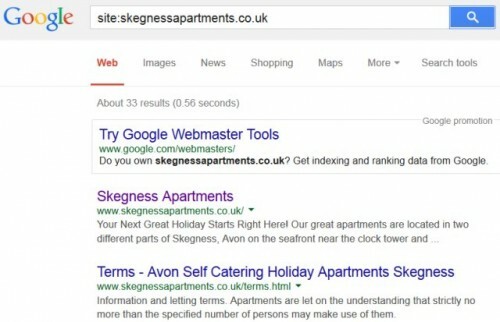 Look at the title tags, over half the indexed pages have the same title element: Skegness Apartments. Read about title tags SEO. This is awful SEO wise. Of the other pages with different titles, 5 are to dead pages (looks like they’d been deleted, no 301 redirects: see 301 redirects tutorial) and the rest seem to all have the same “Skegness Apartments” title tag, but Google has guessed the Contact page would be better titled “Contact – Skegness Apartments”. So the entire site has duplicate title tags, highly unlikely to generate more than a trickle of visitors from Google. 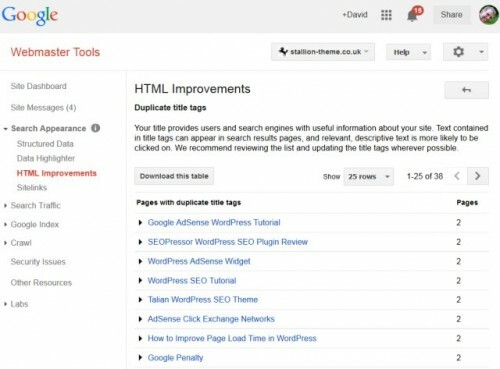 I don’t see any Google Analytics code so looks like they aren’t using Google’s free Webmaster Tools https://www.google.com/webmasters/tools/ or Google Analytics http://www.google.com/analytics/, if they did they’d see multiple duplicate title element tags warnings with advice to set unique titles for every page. For my site Google Webmaster Tools reports for this domain 82 duplicate title tags, that might sound a lot, but because I use the Stallion Responsive Theme SEO Super Comments feature which turns user comments into search engine indexable pages most of the duplicates are from the SEO super comments. As I write this (June 2014) this site has 170 published posts and pages, yet over 3,000 pages indexed in Google (site:stallion-theme.co.uk) and most of them are SEO super comments (this site has around 2,500 user comments), so eighty odd duplicates out of over 3,000 indexed pages isn’t bad (only about 30 with duplicate title tags). The above SEO issues and many more would be fixed by using WordPress, even without using my SEO Theme. WordPress in the hands of even a complete beginner can output better search engine optimized content than an above average local website designer using a program like DreamWeaver. With WordPress though it helps to understand some basic SEO, it’s not the end of the world if you don’t. WordPress inter links your site so everything is easily found by search engines, to achieve the same with a WYSIWYG editor requires manually adding text or image links. When I started using WordPress (2005-2006) I migrated my static HTML websites (like the Skegness site above is static HTML pages) to WordPress blogs. I find the easiest way is to almost start again. Depending on the server/host setup it should be possible to install WordPress under the same domain without loosing the current website HTML pages. I would set it up so temporarily the current index.html home page still loads as the home page. WordPress is a PHP script, so the home page for a WordPress install has a home page at index.php. You can access WordPress via index.php, setup the new site (create new WordPress Posts and Pages to replace the old), setup relevant 301 redirects within the roots .htaccess file and when the new site is ready setup the server to load index.php instead of index.html. If it all goes well (never does :-)) a seamless move. After setting up WordPress the business owner will have much easier access to each pages content (now WordPress Posts or WordPress Pages) and can edit the content directly online (under the WordPress Dashboard) rather than messing around with FrontPage/DreamWeaver type template files and uploading via FTP. If the small business has multiple staff with the ability to use processing software like MS Word, MS Office etc… it’s not a big leap in tech skills to learn to create/edit WordPress Posts and Pages. For simple edits you no longer need to call a web designer and pay for the changes to a product price/description, you do it yourself in-house, WordPress is really easy to use. My wife who is about as tech savvy as a Hamster on a wheel :-) helps me build websites (she might have created more unique content than I have!). For example we own Skegness Attractions, I setup WordPress with my best SEO theme Stallion Responsive and she logs into WordPress and creates new Posts. The problem you have with a business site like Skegness Apartments is you quickly run out of relevant content to create new articles with: there’s only so much you can write about a room! Which is why I’d advise using a similar approach to the Skegness Attractions site, review/discuss non-competing businesses and services. The Skegness Attractions site was setup years ago (not long after moving to Skeg), my wife created over 90% of the content, most of it is things we’ve done in Skegness. She’s got bored of the site (kids grew up, nothing much relevant left to review in Skegness) and hasn’t added new content for years, really needs a content refresh: realised today it still said Skegness Attraction 2013, oops, 6 months into 2014! The WordPress site shows how easy it is to generate a site filled with relevant content about Skegness, 300+ pages indexed in Google with plenty of relevant SERPs. 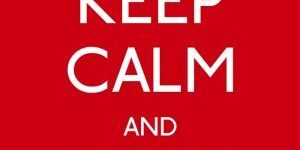 We built the Skegness Attractions site as part of a large network of sites (currently 130 domains), with so many domains to manage you can’t put 100% attention on to one website, at least not for very long: I’m currently putting most of my time into this site, but will have to maintain other sites soon. If we owned only one site we’d create content about as many relevant niches as possible. With a site about holiday apartments would make sense to have web pages about local entertainment, review the Embassy Theater, review all the local Skegness bars and night clubs and direct your Google search engine visitors to a holiday let like I’ve done with this article. I’m directing visitors to check out the Stallion Responsive Theme that I sell as they read this information. My wife is working on one of our newest sites Skinny Me, we’ve been dieting for about two years (small portion diet) and between us have lost about 7-8 stone (we are both at perfect weights now). The weight loss site is running WordPress with Stallion Responsive with one of the built in Stallion designs and header images (nothing customized yet). My wife wants to use a larger image at the top, she’s going to create a 1000px by 288px image that completely replaces the top header area, the new header image will include the name of the site (Skinny Me) in fancy text and I guess some graphics to make it pretty. She will make the image and I’ll go set it up: it’s easy to do, about a dozen clicks of the mouse, will take me a couple of minutes to make the design change. That’s the power of WordPress with a decent theme. Like I said we lost weight on a small portions diet (basically eating less), surprisingly “Small Portion Diet” is NOT a high traffic Google SERP it only has around 210 searches a month! In the weight loss niche diet SERPs are HUGE traffic: “Low Carb Diet” 135,000 searches a month. You can follow a smaller portion diet without cutting out sugar per se, as we lost weight we naturally progressed to thinking twice about what we ate: if you are going to have a sugary treat on an irregular basis it’s better be a treat you LOVE, not just eat it because it’s there! Even Camping Skegness has more traffic compared to Skegness Apartments. There’s plenty of relevant SERPs that could be the starting point for an article promoting a Skegness holiday let (another relevant SERP). 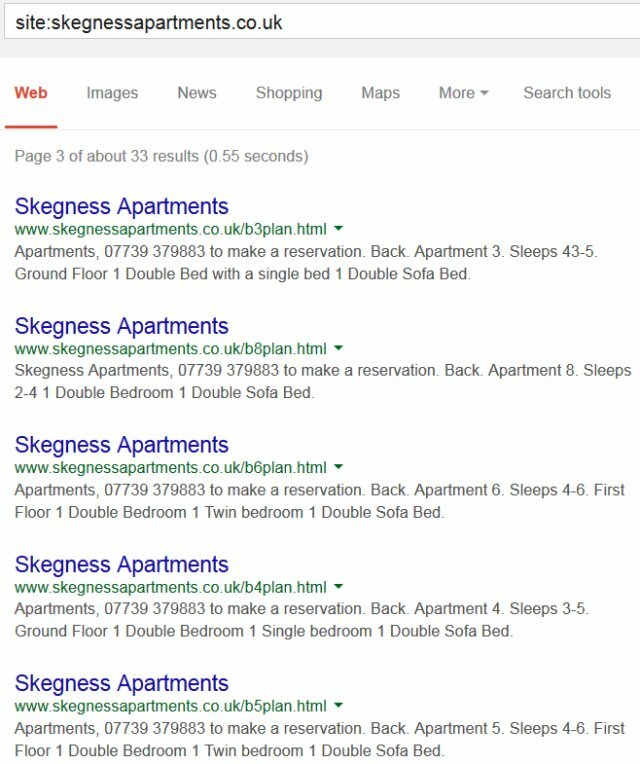 To put things into perspective the actual Google search “Skegness Apartments” generates around 110 visitors a month (that’s not a lot). These are not enormous traffic figures, but local search results tend not to be which is why you have to target as many as possible, currently the apartments site is targeting only ONE SERP! Would you consider Skegness Hotels as a direct competitor to Skegness Apartments? If not adding information about similar businesses, directing potential Skegness holiday makers to good local hotels if they aren’t looking for a self contained apartment can generate relevant traffic. They might find your site looking for a Skegness Royal Hotel Review (a popular Skegness hotel) and decide to rent one of your apartments instead. If you don’t target similar business SERPs you wouldn’t see most of those visitors anyway, if your service is good persuade the visitor to try you instead. I’d create a new WordPress Post for each of the self contained apartments and target a different set of SERPs for each. The Avon property has 7 apartments, that’s 7 WordPress posts, target each at a different set of search phrases. One could be targeting Skegness Holiday Flats (110 searches a month), another Holiday Flats Skegness (210 searches a month), another Holiday Apartments Skegness (140 searches a month) etc… do the keyword research to find more with relevant traffic. I’d take photos of each apartment (and views) and add them to the posts, on each post I’d also include an inspirational image related to Skegness: whatever your visitors tend to do while here, on a Skegness golf course for example if golfers are your customers. I’d add the prices for each apartment so your visitors have a self contained webpage with all the basic information they need with the ability to contact you via a contact form (could use the WordPress comments for basic queries), email address, postal address, phone number etc… I’d also add when the apartments are available (that will require regular updates), will save your potential customers time if they know a flat isn’t available on July 1st for example and save them time. By linking all 7 apartment posts together when one isn’t available on a particular date direct them to the other 6 (and your other location). If that was my one and only business site and it was important I’d expect to have at least a hundred articles added within a year and continue to add more year on year. 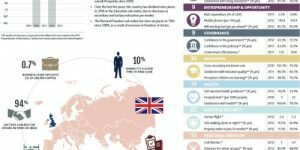 I enjoyed creating this article, been a while since I wrote this sort of detailed break down for an ‘SEO client’ (used to write emails like this all the time for SEO clients). Hopefully it will help lots of small business owners as I’ve tried to keep the information as general as possible whilst still being specific. Having followed your advice on SEO for the past five years, I must say, you continue to inspire and motivate me with your writing about online business. This article reminds me of when I was first learning about writing a business plan. After a decade of being in business, I still need to be reminded. Be unique, define your competitive edge and know your target market and your competition. Again, the same laws of nature that entitle one to succeed in offline business are the same as those for online. See you at the top my friend!